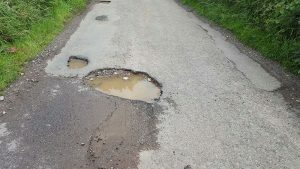 A group of Residents living on some of East Cork’s worst potholed roads have hit out at Cork County Council for the continued neglect of their area. Siobhan Ahern from Killcounty, north of Mogeely, led a deputation who attended this week’s East Cork Municipality meeting. Mrs Ahern told the senior executive they are fed up of the patchwork that has become their road after constant pothole repairs. Over €16,000 has been paid in development contributions by the residents in the past 6 years for improvements in their infrastructure, along with road and local property taxes. Almost 13 km of road network in the Killcounty, Corbally, Barradaw and the Ballyere areas, are so badly neglected, the road surface has washed away with residents driving on rock and stones. Siobhan Ahern who represents 61 households in the area said it was “horrendous” the state of the roads, with areas waiting over four and a half years for a pothole to be filled. She said the potholes the Council do attended to are washed out again once the rain comes, causing hundreds of Euro worth of damage for the motoring public. Additionally the bridge at Killcounty Cross, which has a 30 foot drop, needs immediate attention, after a 15 foot section collapsed over 4 years ago. Children as young as four years of age travel the route to school in Inch and it is also used to transport secondary school children to Youghal. In an unprecedented move Senior Engineer Dave Clarke responded to the delegation ahead of his report to Council on the matter this September. Mr Clarke said Cork County Council’s roads budget has been running on fumes for years, coupled with a reduction in staffing levels due to government embargos. He said many of the roads in the delegations area are “legacy roads” which need resurfacing and overlay. He said the continued issues were due to poor drainage. €95 million was collected in road tax in Cork County in 2016, yet only €44 million was re-invested in the County’s 12,500 kilometres of road network by government. 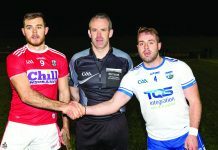 Last week members of Cork County Council’s Roads Directorate and its Drivers across East Cork went on strike for four hours in an ongoing dispute with Council management. The stoppage formed part of a county wide protest over the authority’s refusal to recruit more staff in key sections of Road maintenance, housing and other critical services. All Councillors present at Monday’s sitting spoke of their embarrassment and said they felt the resident’s frustration and anger, however they were restrained by government funding. All representatives urged the areas TDs to fight for further funding for the areas failing road network.